Savour a lavish buffet breakfast, afternoon treats and a fabulous five course dining experience with crisp salads and antipasti from bar and sumptuous meal plan… isn’t it so exciting to read? ‘Anybody can make you enjoy the first bite of a dish, but only a real chef can make you enjoy the last’, says Francois Minot. Freshly baked breakfast breads, home made jams and marmalades, assorted yogurts, cheese specialties over 30 different kinds of teas and … Don’t miss our degustation dinner menu over candlelight and our special fondue-style dinner – served once a week as a special highlight, goes the advertisement of a restaurant. Can anybody say ‘no’ to this? How can we? Eat the dainty food of famous chefs with the same pleasure with which they devour gross peasant dishes mostly composed of garlic and tomatoes fried in heavily scented olive oil. Here is an attempt to know the horoscopes of chef as a way to thank them for pampering our taste buds with a sumptuous banquet. There are many methods of cooking such as baking, roasting, frying, grilling, barbecuing, smoking, boiling, steaming and braising. A more recent innovation is microwaving. Various methods use differing levels of heat and moisture and vary in cooking time. The method, chosen greatly affects the end result. Some foods are more appropriate to some methods, than others. If food is not cooked, stored and handled correctly, you become ill with food poisoning, colds, flu and other conditions. ‘Use different chopping boards for raw and ready-to-eat foods’, says Hardgrave. Cooking food at the right temperature will ensure that any harmful bacteria are killed. Food has become a part of material culture and cuisine is much more than a substance. The ingredients naturally contain various amounts of molecules called proteins, carbohydrates and fats. They also contain water manipulation of the chemical properties of these molecules. 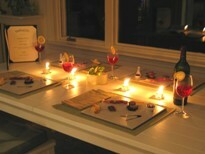 In a restaurant, a menu is a presentation of food and beverage offerings. It may be a la carte in which guests use to choose from a list of options or table d’ hote, in which case a pre-established sequence of courses is served. The word ‘menu’ is French in origin. The original menus that offered consumers choices were prepared on a small chalk board, in French a carte. So foods chosen from a bill of fare, are described as a la carte, according to the board. There are other types such as a static menu, a cycle’s menu, a market menu and a hybrid menu. Ethnic menus are offered in French, Chinese, Japanese and Indian restaurants in which the names of items are translated into English. Dessert menu caters to the public with a sweet tooth. Most outlets with this specialty would have captive confectionaries to give them an edge. Diet menus have become significant with the health-conscious modern public. Snacks Menus are offered in between regular meal timings. They are popular with students, shoppers or casual eaters. They have veggie burgers, veggie club sandwiches, milk shakes, juices, soda fountain specialties and colas. The Poolside menus offer snack food like veggie club sandwiches or veggie burger items. It is the art of preparing and cooking foods. A culinarion is a person working in restaurants and taking the responsibility for skillfully preparing meals to cater to the taste of the palates of the people. How the delicious meals are presented in a pleasing way to the eye of a person is very important for the cook, in a restaurant. He is also known as ‘Chef’. In 1800s the first cooking school in Boston was teaching the art of American cooking and prepared the students to pass on their knowledge to others. The first cook-book was written by Fannie Merrit Farmer in 1896. In 1946, James Beard held regular cooking classes on the art of American cooking who is known as the grandfather of the American cuisine. The French cuisine was brought to life in the American society by Julia Child in 1960s over the radio. Later the Culinary Institute of America was founded and was the first to hold career-based courses on the art of cooking. 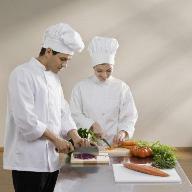 Chef is a French word, which means ‘Chief of Head’ but is used generally to refer to a person who cooks. In the cooking industry a chef is usually the head of the kitchen, who sets the menus and supervises how they are cooked. The ranks in the kitchen are such as Executive chef, Chef de cuisine, Sous chef and Chef de partie. Executive chef is the one in charge of the kitchen menus, provisions and overall food taste, appearance and presentation. His name is indicated on all the dishes the restaurant produces. Chef de cuisine sometimes creates signature dishes. Sous chef is the assistant to the Executive chef such as supervising and cooking of special dishes. Chef de partie (station chef) is in charge of the restaurant where buffets and different types of food are served. Today we are conscious of our health. The chef in a restaurant should offer a healthy meal to be mouth-wateringly delicious. He knows what ingredients are in every recipe on the menu. He masters the food allergies and could identify a tasty alternative for any such ingredients in a dish. If you are allergetic to wheat products, he offers you with the same nutritionally balanced but a different menu. Many chefs may receive the opportunity to develop specialized menus for athletes, performers or even those who are personal chefs for celebrities and other high profile people must cook with certain nutritional guidelines in mind. It includes a hat, necktie, double-breasted jacket, apron and shoes with steel or plastic toe-caps. A chef’s hat was originally designed as a tall rippled hat called a Dodin Bouffant. The Dodin Bouffant had 101 ripples that represent the 101 ways that the chef could prepare eggs. The modern chef’s hat is tall to allow for the circulation of air above the head and also provides an outlet for heat. The hat helps to prevent sweat from dripping down the face. Neckties were originally worn to allow for the mopping of sweat from the face, but as this is now against health regulations, they are largely decorative. The jacket is white to show off the chef’s cleanliness and repel heat and is double-breasted to prevent serious injuries from burns and scalds. An apron is worn to just below knee-length to assist the prevention of burns because of spillage. Shoes and clogs are hard-wearing and with a steel-top cap to prevent injury from falling objects or knives. With fire or electricity we cook food. It is necessary for our livelihood. And of course without a passion towards cooking, the food won’t taste good. Mars is an indicator of passion and fire. All are good eaters, but a few can only say with which ingredient, the food is prepared. The balanced tinge of salt and spices make others to have more and more. Moon denotes the liking for food. A man enjoys eating food when there is a combination of Mars and Moon. It is a highlighting point in which a degree of variation is being shown with a remarkable difference. Venus stands for cool drinks and all kinds of beverages including milk and dairy products. Saturn is the planet which helps a person to prepare the products and do the manufacture. If all these planets are linked to Lagna or 10th house in the horoscope of somebody , he becomes a chef.